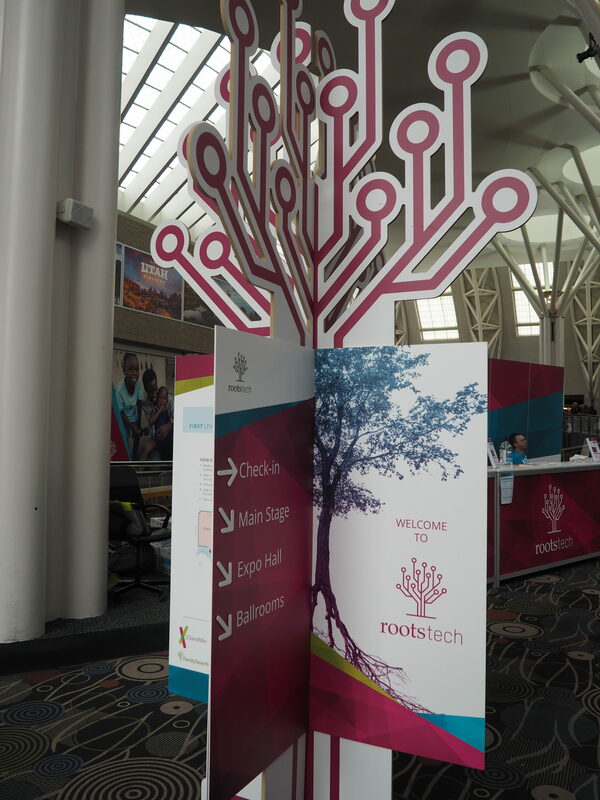 Psssst….RootsTech is back, Y’all…in a BIG way – so spread the word! Not that it was ever really gone – but the bad reports from last year had me worried. 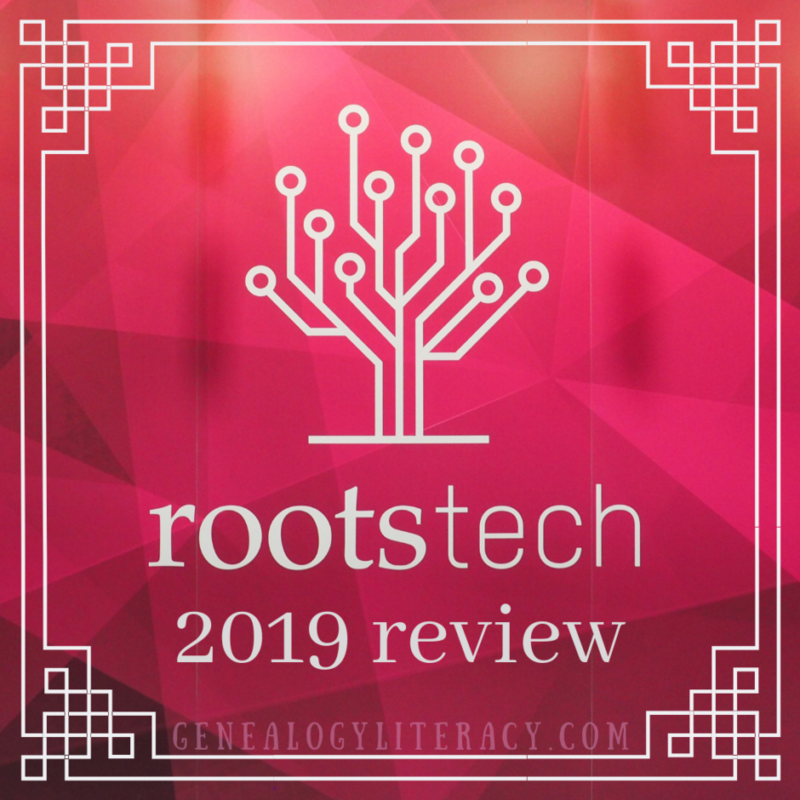 Despite my inclination to be a wordy blogger – I must admit I am almost speechless where RootsTech 2019 is concerned. 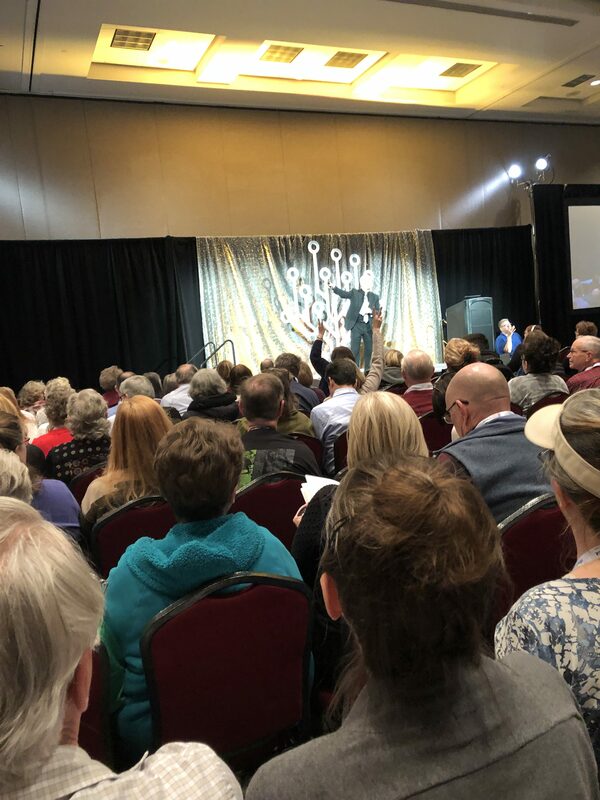 This year’s conference surpassed my grandest expectations – and I can safely declare that this was (by far) the best one I’ve experienced yet. To be clear, there was never a point when I could not get into a class, nor felt overwhelmed by crowds, nor had to stand in line for anything – except at the concession stand for lunch one day – which is to be expected, and even that was only about 10 minutes. 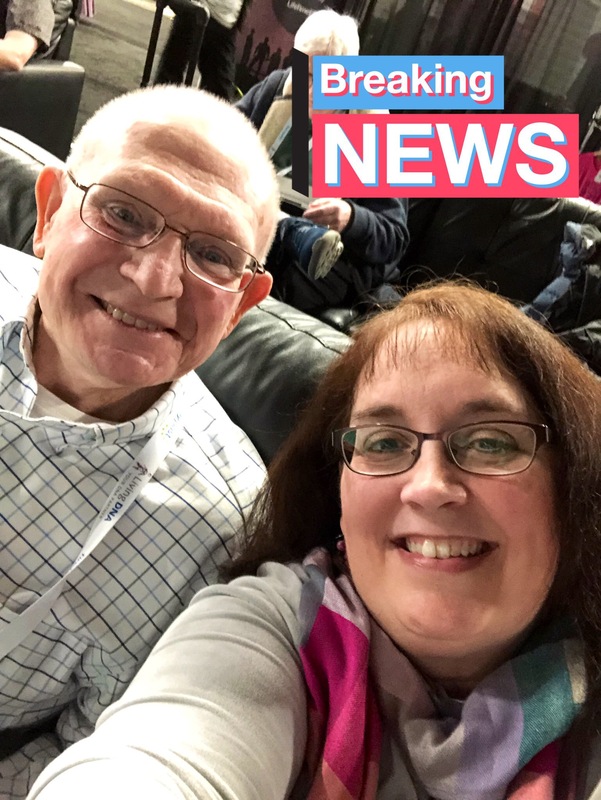 The attendance totals have been in for about a week, and the general conference numbers hit over the 15,000 mark (with over 23K for Family Day) – signaling a rousing success, as usual. Conference badges by mail: This meant many of us walked into the Salt Palace ready to hit sessions, instead of standing in line to pick up packets. Lanyards, badge cases, and conference bags were in multiple places throughout the Palace, making pick-up a breeze. Spreading out – By placing check-in over on the far side of the Salt Palace, along with a few of the sessions, there was more breathing room. Heading over in that area brought back memories from the early years when RootsTech was only on the north side of the Palace. Look how far it has grown! No badge scanning, except for lunches and labs. No session lines, and no one chased you out if your next session was in the same room. 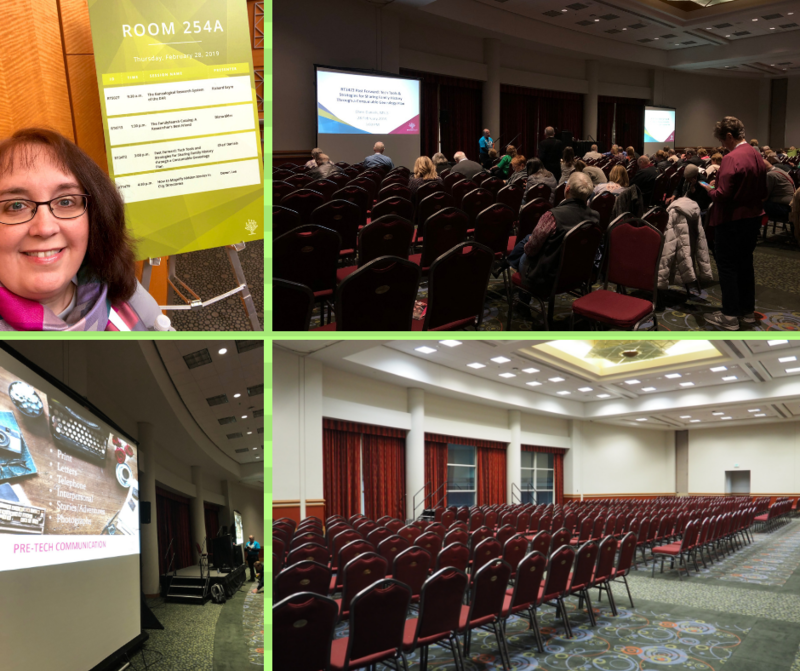 Opening sessions at 11am – Some folks grumbled about this, but not me – I loved this change! This allowed folks to wonder over there to find a seat in their own good time – instead of everyone running over to find a seat first thing in the morning. I am not a morning person, and getting to the 8am sessions is hard enough – but with a half hour to get over there after the earlier morning sessions, I didn’t feel rushed. Besides, once the lights go dark and you’re enjoying the festivities, you have no idea what time it is. 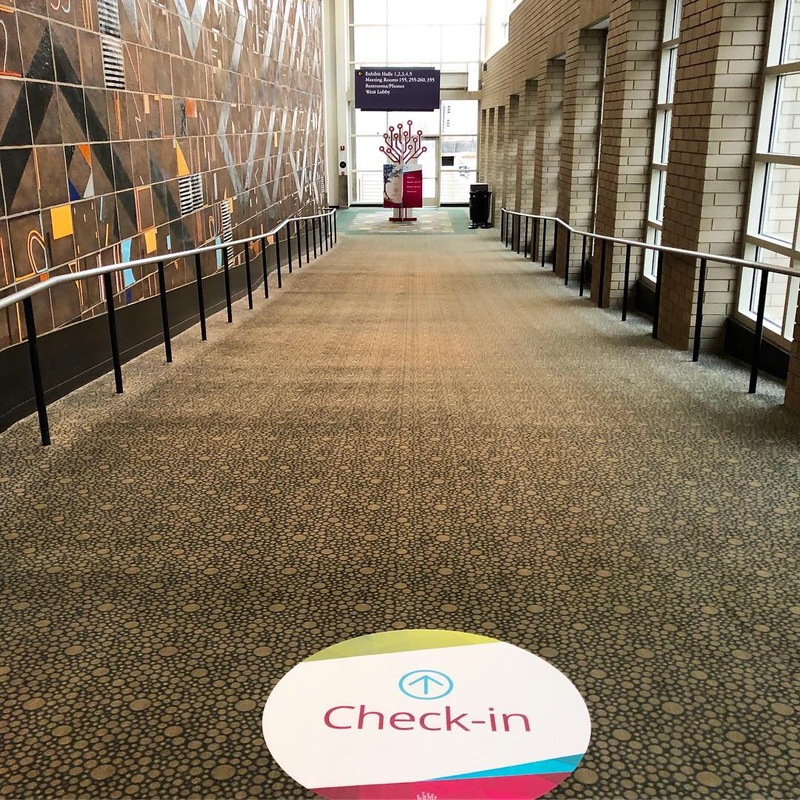 Plus, after the program is over, folks are in a festive mood, and enjoy talking with each other – they can go to lunch, hit the exhibit hall, engage with fellow attendees, or plan for the afternoon sessions – instead of rushing off to the next session. This change also means the livestream opening sessions were hitting the central/eastern time zones around lunch time – making contiguous enjoyment (and social media engagement) more possible. Easy to identify, helpful staff – perfect number ratio of helpers to attendees. If I needed help, they were always just a few steps away – and very attentive. Great signage! Vertical and horizontal signage everywhere – even under your feet! Me and my Kentucky “Cousin”, Tom Beatty! SLVGS Board Members: President, Miles Meyer, Vice President, Sue Taylor, and Secretary, Cheri Daniels. 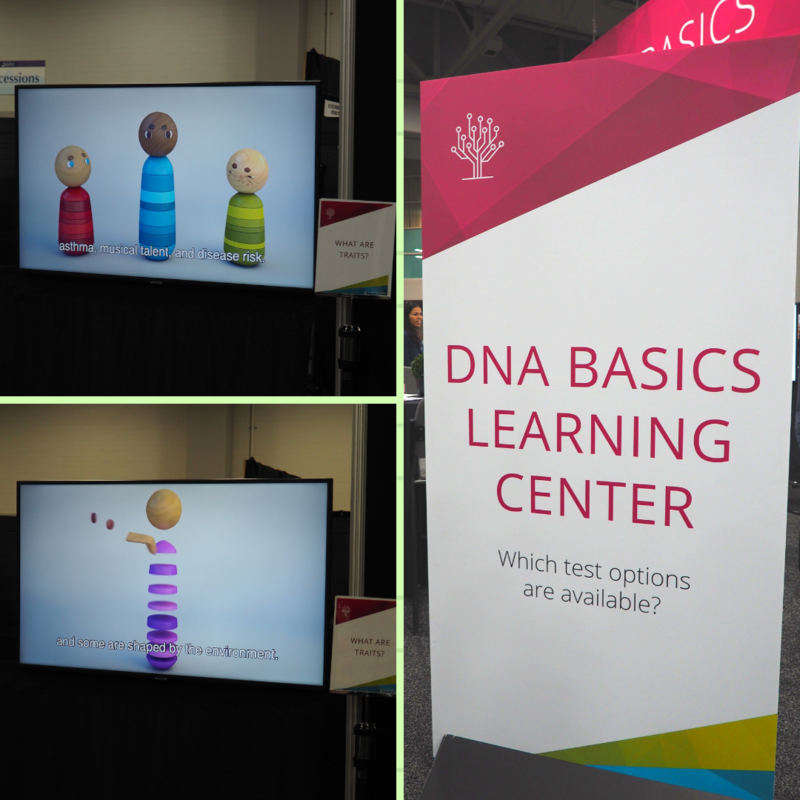 The DNA Learning Center – Introductory DNA sessions to help with this topic: Always crowded, with loads of mini-sessions, various speakers, with helpful videos and knowledgeable staff. 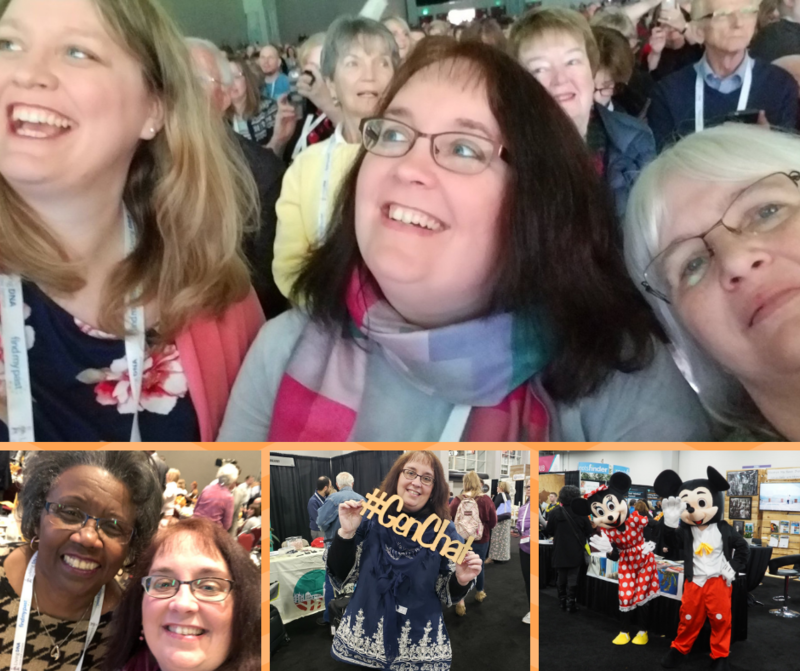 The RootsTech Store: I LOVE swag! And even when it’s not free swag – I am very willing to purchase more! It was a nice open store, easy to shop with so many cool options! My suggestion for next year – Please produce a sweatshirt or hoodie! It’s cold in SLC in late February! I would have snapped that up! 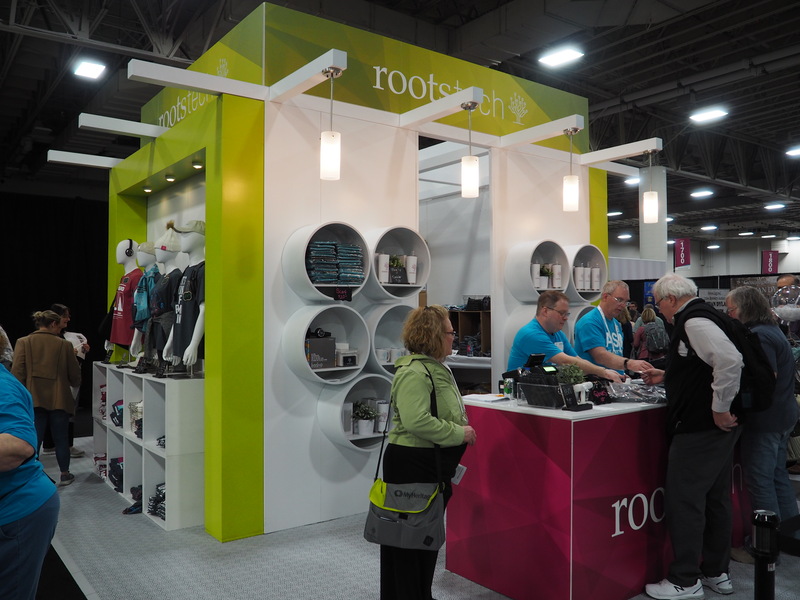 Hey, RootsTech officials – you might want to create an online store of RootsTech swag – I’d seriously send my family members there to fill up my Christmas wish list! The Demo Theater: Smaller than previous years, and hidden towards the back – but always crowded. I always learn a lot in this space while I’m taking a breather in a very comfortable environment. They also have door prizes, BTW. 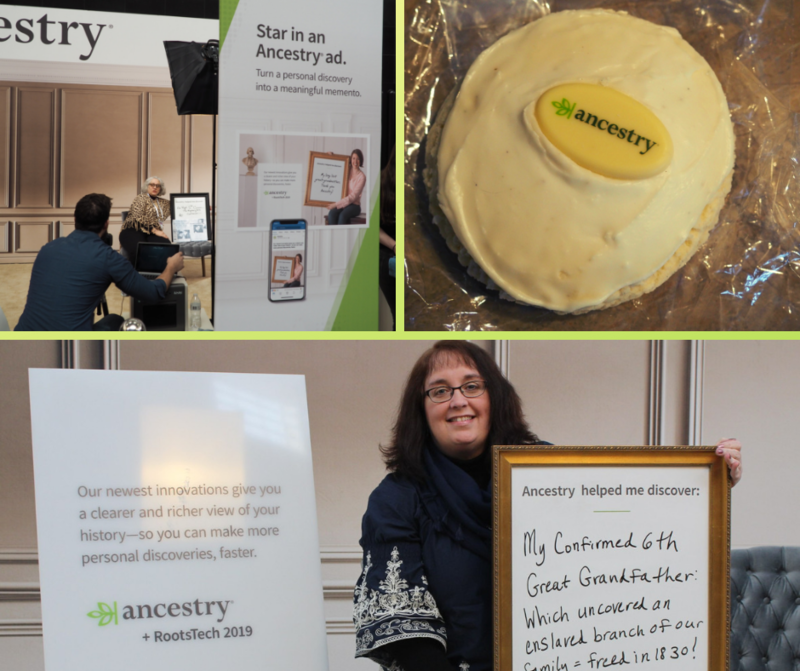 The Ancestry Photo Booth – and their wonderful cookies! : Confession: At first, I kinda rolled my eyes at this – but then thought, hey, I’m kinda dressed up and I had a new find to share, so I gave it a try. The result, in this glamorous backdrop, was pretty awesome! They not only sent me the digital image they took with their beautiful professional camera, but also a lovely print to take with me – topped off with an amazingly tasty cookie! Well played, Ancestry! Well played! Meeting up with genie friends, as usual: I always love meeting old and new friends! Added Bonus: Researching in the library! : We flew in a few days early to research for hours and hours – and I regret nothing!! Always a fantastic time – and so much brought back to add to my tree. Some serious brick walls damaged in that library! I’m still processing all that I brought home. 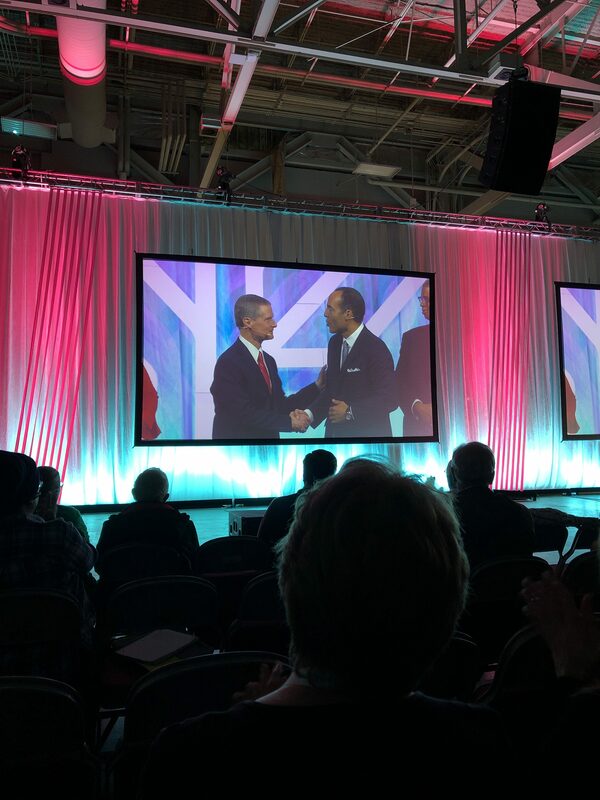 Unconferencing Sessions: I had not been to RootsTech in a few years, and my memory of the Unconferencing area was drastically different than I encountered this year. Gone were the small curtained off areas where you could talk to a group or even present something on the provided board, or diagram ideas. This concept has now been relegated to 8 tables crammed into the space of about two booth footprints. Really didn’t like this shrinkage, and while I did see groups using it – it was also placed in the very back of the exhibit hall instead of in the front where it used to be. 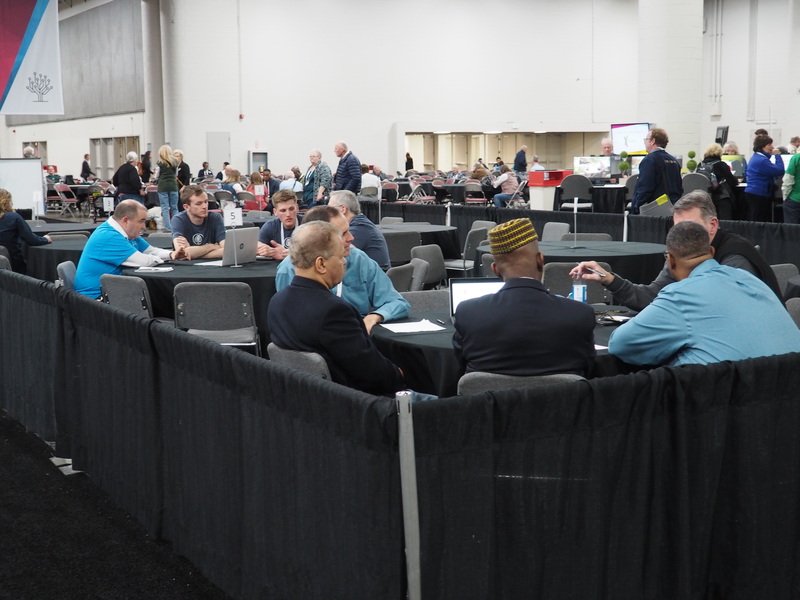 Most people I talked to never found its location, and with very little signage – I would say this looks like the last year for the Unconferencing area – as I’m pretty sure we were witnessing the death knell. Some of the presenters mentioned their disappointment with the size and location in our Facebook group – but also complained about the name – saying it was unfriendly, and not appealing. Perhaps it could be resurrected as something slightly different? Break-out sessions perhaps? Obviously, the large exhibitors enjoy great success with their own areas of demos and discussions – so the concept is not a bad one. But it would be nice to have a more tailored area for folks to discuss genealogy issues – or meet up with speakers after their sessions, or programmers to discuss concepts with users (as was its initial purpose.) Conversely, I also understand usage and statistics – if people weren’t using them in the previous years, I can understand the reduction. Access and Preservation Track on Wednesday: While this was a nice set of small, targeted sessions, I think many people misunderstood its purpose. As a librarian with special collections/archival training, I was going to attend this, no matter the purpose – but after squeezing in to the last couple of seats at 8am, and then watching the attendance bleed out like a trauma victim – until there was only about a third of them left – was a red flag that most people didn’t understand the intended focus. 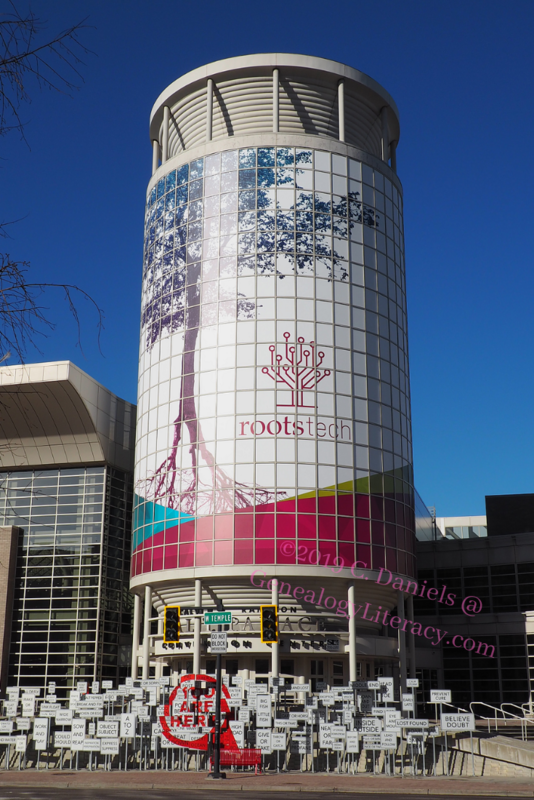 As a whole – I would say this was RootsTech’s version of “Librarians Day” – or “Digital Archivist’s Day” – etc. Which makes all of this more intriguing. 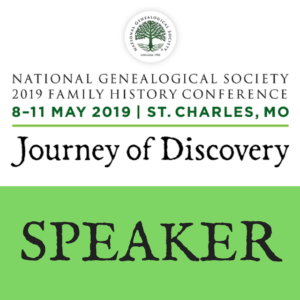 With the huge crowd coming in to learn about “Access and Preservation” – regular folks who were not information professionals – doesn’t that indicate that the general genealogy crowd is very interested in preservation and access – for their own collections? Perhaps? Or were they wanting to learn more about the efforts being made to place more unique material online? Or did they want to learn more about digitization best practices? 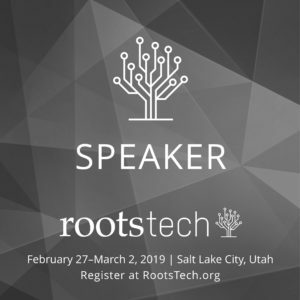 This is an area RootsTech should investigate. It sure caught my attention when thinking about this after the event. Demo Stage: Thank heavens it hasn’t changed too much – but again, it’s been shrunk, and placed in the back, instead of being a focal point of festivity for the Exhibit Hall. Gone is the soda fountain bar and popcorn – and gone is the concept of walking around and hearing some of what was being demoed. I’m guessing that was the problem. As the Exhibitors have adopted their own demo areas and engagement clusters with microphone and large screens, their sound would be in competition with the Demo Stage instructors, and that would not be pleasant for the big sponsors. At least the comfy chairs and couches were still there – along with some really nice door prizes for those who sat through the individual demos. Daily Sheets: They announced that there would be daily handouts with the general session info, as well as a list of the most popular classes that day. Ummm, first of all, I never found any of these sheets, until I stumbled upon a small pile on the very last day for Family Day. To be fair, I didn’t look super hard for them during the regular conference days. However, I’m not sure about plucking out a handful of sessions to highlight as “popular”. That could go one of two ways – either it drives a ton of people to these sessions, resulting in overcrowding, or it drives people away since they want to avoid the large crowds if possible. Plus, as a speaker, the speaker liaisons, kept trying to avoid giving us room capacity and info on popular sessions because they said they didn’t want to make other speakers feel less worthy by identifying popular sessions based on topic, speaker and/or room size. But then each day, they were highlighting popular sessions to hand out to everyone. Since we all have the app and the conference booklet outlining the offerings of each day – I don’t think they need these daily sheets – and I’m sure they could save a little money in printing. 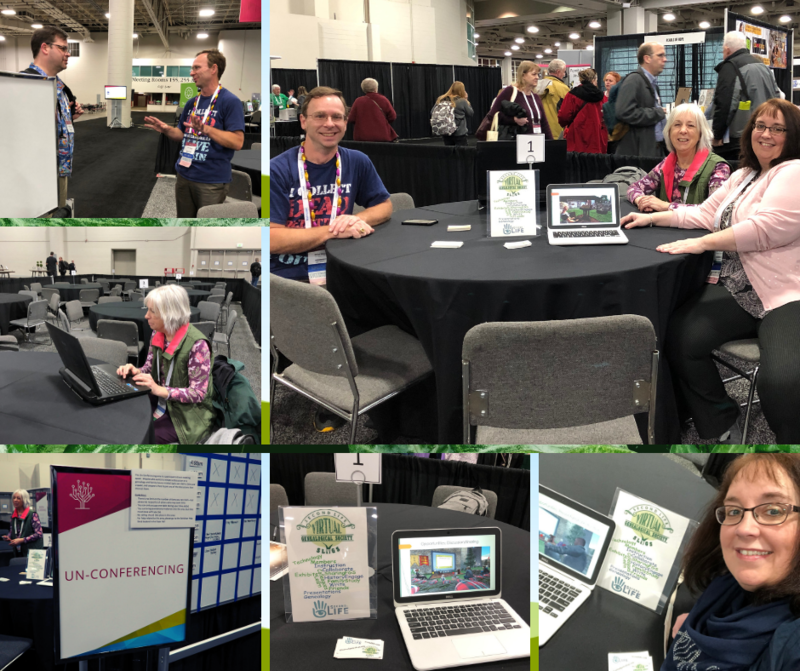 RootsTech is not really over – you have several options to take in more of this conference over the next several months: Watch the canned livestream videos; Download the Syllabus Material; Explore the Exhibitor List – and prepare to watch more when the international version of RootsTech premiers in London in October! “A whole lot of healing going on.” Family Search’s Donation to the IAAM – Go Watch this video! This type of experience is unparalleled, and should be experienced in person at least once. 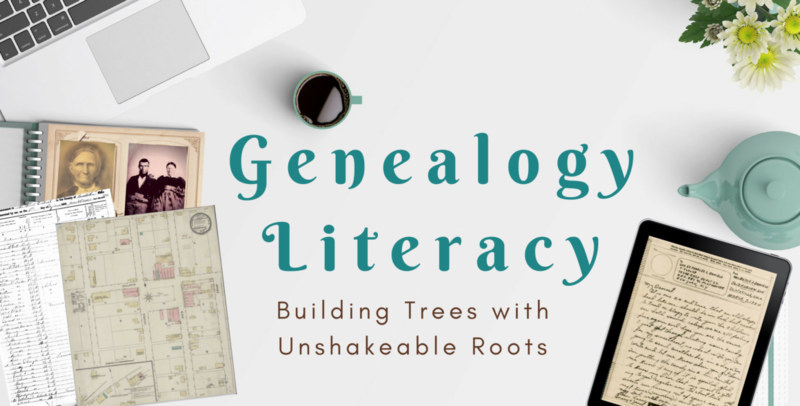 Obviously, for continued inspiration and exposure to the most current genealogy tech tools, it is encouraged to attend as frequently as possible. 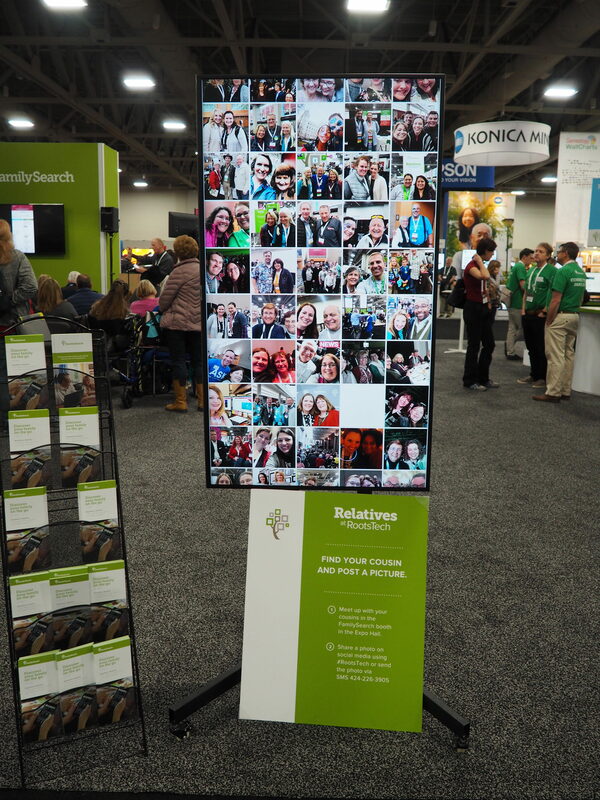 However, as a tech conference, RootsTech has ensured that there are multiple remote methods for attending virtually. 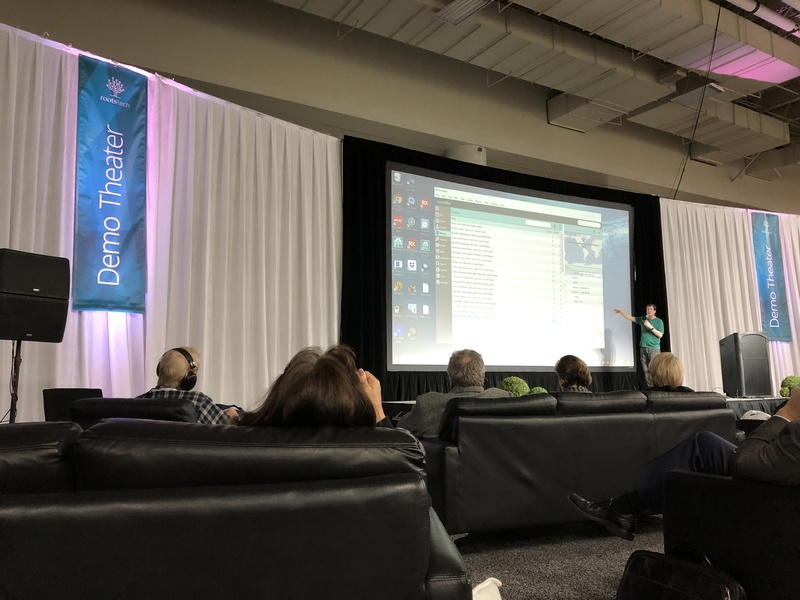 Not only can you sit at home and watch several of the videos for free, but this year they also offered a virtual pass that allowed you to enjoy 18 sessions from the comfort of your own home. 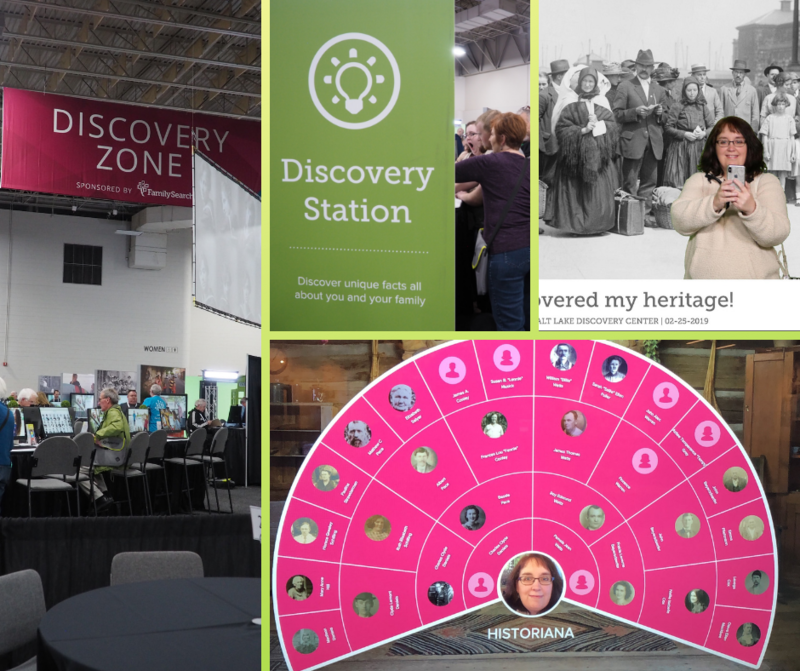 Coupled with the exhibit hall list for traversing via websites at your leisure, and syllabus material you can download, #notatrootstech folks have a buffet of learning opportunities available. 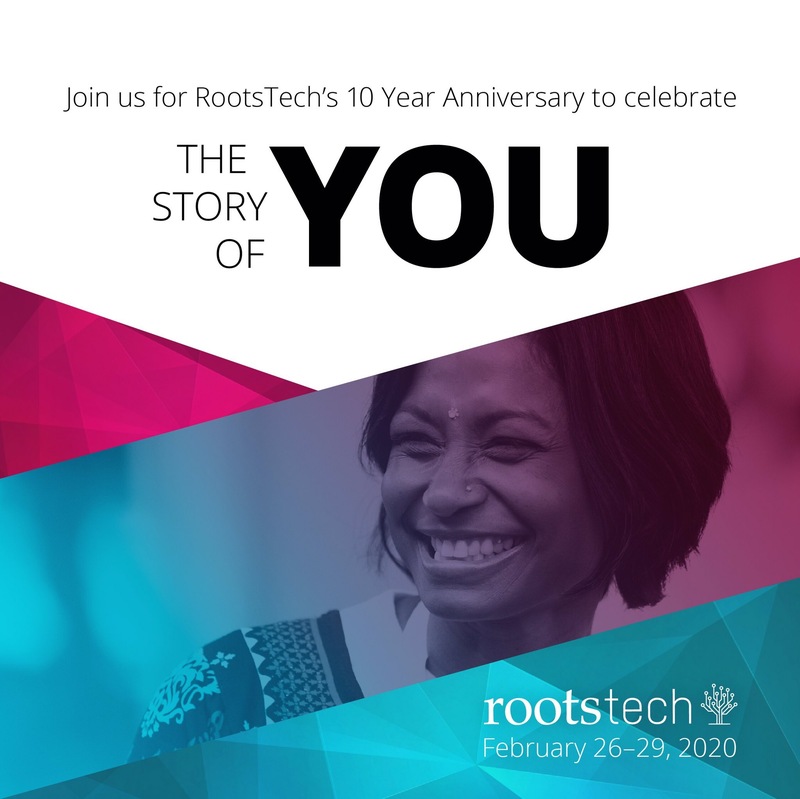 BTW, Next year is RootsTech’s 10th anniversary! Theme: The Story of You! Make plans to attend – I’m sure this will be a grand and unforgettable party! 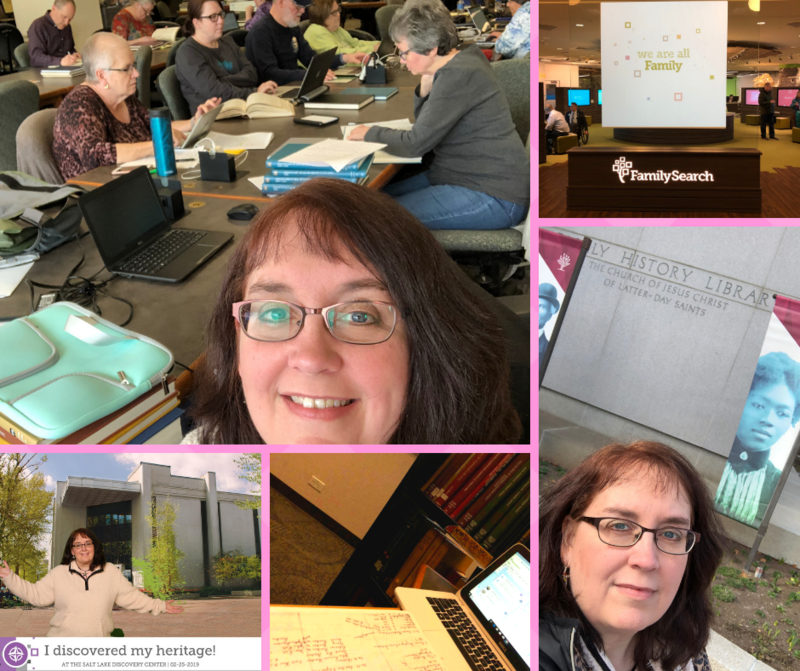 From day one, I declared that Genealogy Literacy would be a truth zone – and after breaking through a recent brick wall, I knew I had to share this journey of discovery. 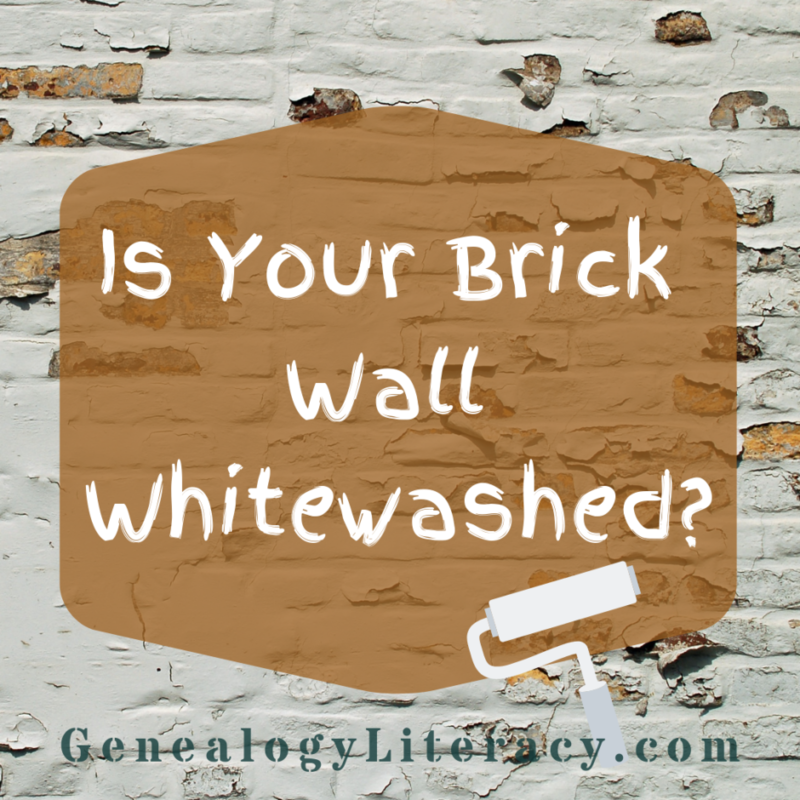 For you see, this research unveiled an ugly truth: My long-standing brick wall had stood firmly in my path until I was able to strip away the whitewashing put in place to divert descendants from the truth. Let me begin by saying that many researchers have encountered whitewashing in various forms. Most African American researchers with enslaved ancestors encounter systemic whitewashing of their history through heinous laws and customs put in place that stripped families of their identity to perpetuate the evils of slavery. And while I have always been an advocate for healing through a more inclusive research approach, the story below demonstrates how vital it is for ALL of us to strip away the mindsets of the past and dive headlong into a full FAN Club approach. So, we’ve all been taught about the FAN Club research method – Friends, Acquaintances, & Neighbors (or Family, Acquaintances, & Neighbors) – but can I get a show of hands how many of us actively search African American records for our white family surnames? 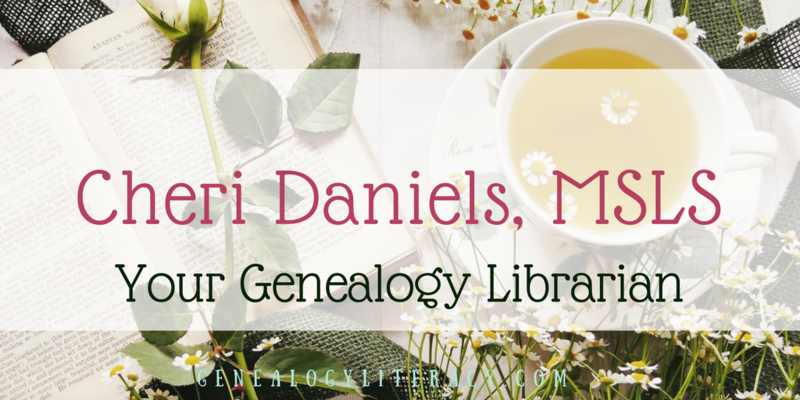 When encountering that title on the shelf about AA cemeteries or marriages – if we don’t think our family is inside, do we just breeze on by? Years ago, I would have said, “yeah, guilty as charged.” But in the past decade or so, the desire to help bring families together through research has shifted my information gathering strategies, and I find myself in AA records on purpose to help connect people and better understand communities. A few years ago, I was researching an African American family from Bracken County, Kentucky – and I have to say, some locals there have created a beautiful resource – African American records, Bracken County, Kentucky : 1797-1999 – a two volume set of transcribed AA documents discovered throughout the county. Marriages, Court Cases, School Records, Taxes, etc. You name it, they pulled it and transcribed/indexed it to create one of the most useful local resources I’ve ever used. So, while I was there, I decided to look up all of my Bracken County associated families in the index. This was rather quickly done, because I do not have a large number of branches from this county, and most are mid-19th century German immigrants – but I also descend from a long line of Anglo families from the county next door. As my search was not yielding any fruit, I decided to try a surname from the neighboring county that had remained a brick wall for myself and previous generations. What I found not only cracked the wall, but brought it tumbling down – and unveiled the whitewashing that had built the wall through a false family narrative. My brick wall began in neighboring Pendleton County. My 4th Great Grandfather, Samuel Cox, had married 3 women over his lifetime – the first two named Mary and the last named Barbary. With his estate division, Barbary was easy to identify, and even fill in her backstory as the former widow of a neighbor, Ross McCall. The other two Marys were much harder to distinguish. Over the previous generations, some family members had mixed up the women’s surnames. A divorce case for Mary #2 was able to identify her potential surnames (yes, she had more than a couple in the depositions), leaving the first Mary (my ancestor) with the pre-marriage surname of Dean. As my 4th Great Grandparents were not married in this area, we only knew her surname from the Barton Papers – a collection of family interviews taken throughout Pendleton County by Edward Everett Barton, a local attorney of the 1930s & 40s. Since he interviewed various descendant branches, the stories differed on who her parents might have been. The family group sheets compiled from these interviews identified her probable father as Abel or Michael Dean, but did not include a location for either man. Even the Cox family was a bit of a location enigma. The Barton Papers said Samuel Cox was either “born at the fort above Augusta” or from Pennsylvania. OK, so with the surname of Cox, this was a needle in a haystack. All I knew, is that the Cox family came from farther points east. And I suspected the lack of Dean information indicated the same migration pattern. This turned out to be accurate, but unless I had picked up that book, I may not have discovered the truth for many, many years. In 1830, Bracken County, Kentucky, there was an emancipation filed in court to free an enslaved family: Jenny or “Jinny”, and her three children – Aaron, Emily, and John Caesar. As part of this process, Jenny, Emily and John Caesar were all presented in court to record their description along with a $500 bond to ensure they would not become wards of the county. Jenny is described as “black”, about 30 years old, left eye blind of cataract, standing 4 feet 2 inches. Emily was described as 6 years old and “yellowish” in color. John Caesar was only 4 weeks old with “yellowish” complexion. My biggest question about this document, was: Where was Aaron? Why was he not presented in court with the others? Obviously, with the children described as having “yellowish” skin, I’m thinking Michael was their father. But I had more research to do. The next item in this book connected to Michael Dean was his will of 1832. In this document he makes sure, once again, that all of his slaves are free upon his death, but with one addition. He then gives Jenny his 50 acres and residence for her to live in throughout her lifetime. After her life is over, the property was to go to Aaron and his heirs forever. There is no mention of Emily or John Caesar inheriting anything from Michael, only Aaron. As I was also trying to piece together the known white children of Michael Dean, there is a mention of one in his will, Rebecca Morris. These documents gave me the push I needed to investigate further, with this new county of focus. From further research, I discovered that Michael was a Revolutionary War Pensioner, previously of Lewis County Kentucky, and that he had other white children documented: John, Rebecca, Thurisa, and Abel + others yet to be positively identified. His pension application in 1818/1820 described a sorry existence. A man (aged about 80) and wife (aged about 73) who were practically destitute and living in a meager cabin on 50 “rented” acres. He had served on the Virginia Continental Line for 2 years – ending his service in March 1778 at Valley Forge – Ironically, making it through the horrible winter at Valley Forge, but then high tailing it out once his service ended that March. He and his wife were both described as “decrepit” and only owning a horse and cow. More importantly, no mention of enslaved individuals. All of this testimony resulted in him receiving $8 per month until his death. In searching for Michael, there is no indication that he owned slaves around the time of his pension application. However, very soon after, his son Abel appears on the tax lists, and each man takes turns paying taxes on enslaved individuals for the next several years. The number of slaves fluctuates as well. At first there is only 1, then 2, and as these individuals either move from place to place, or are simply covered in taxes by each man in turn, the maximum number of slaves covered in the taxes, up until the emancipation is 4. 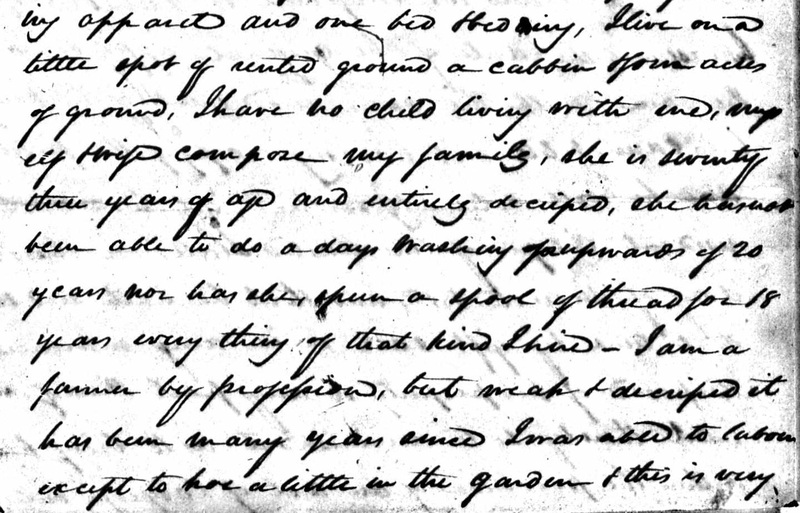 After the emancipation, Abel is paying taxes on a few extra slaves, but his number is scratched out and reduced by 2 – perhaps indicating the odd nature of the ownership? Clearly Michael is claiming ownership by taking Jenny and her children to court to have them freed. Also, despite Michael claiming he only rented his land and cabin in the pension testimony, he clearly owns his property as he gives instructions on its dispersal in his will. 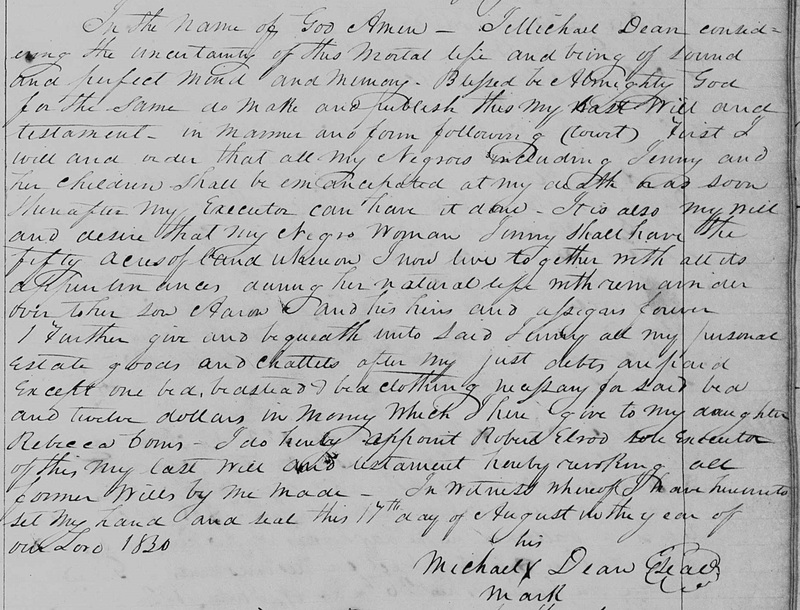 When looking at the Court Orders for Bracken County, Abel would appear to fight some of this – I could not find an actual court challenge – but Abel is instructed to bring his father’s will to court, more than once – and it appears he did not comply as the will is later presented to court by the Executor Robert Elrod. Personally, I was thrilled to find this family. And I would love further still to reconnect with descendants of Jenny and her children. But I found it disappointing that my family had kept silent on this story. You see, I did find a marriage record in Lewis County for Polly Dean and Samuel Cox, with the consent given by Polly’s father “M. Dean” – putting to bed that Michael was her father and Abel was her brother. And I know that Mary died rather young, and with Samuel’s subsequent marriages and sensational divorce, it’s no wonder that my branch of the family lost this story. Or, am I giving them a pass where one doesn’t belong? In the context of society in 1830/32, this action by Michael was completely out of the ordinary. With his will bestowing his property upon a formerly enslaved family – this would have been considered to be scandalous – and I so wanted to know how my branch of the family felt about this action. If my suspicion is correct, one of the men likely fathered Jenny’s children. Meaning that Aaron, Emily, and John Caesar would have been siblings or nieces/nephews to my Samuel and Mary. Did they care? Were they embarrassed by this? It was a very public action to free them, and Michael had done just that. While my branch kept silent about this action when passing along family lore – they did leave me one clue about their potential feelings. Remember when the list of enslaved individuals presented in court lacked one member? Aaron had been conspicuously absent from the court presentation. I speculated that maybe he was sick and could not make it, or that he had run away. Bracken County Kentucky lies on the Ohio River, just across from Ripley Ohio (Brown County) – a known hotbed for the underground railroad in the upcoming years. As the months passed, I figured that this portion of his story may never be known. And this is when I found a hashmark that changed everything. 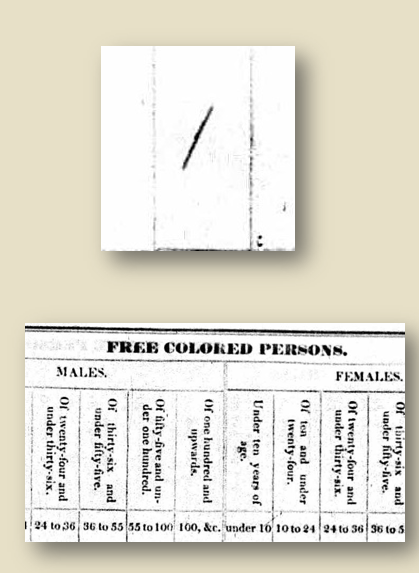 In the 1830 census – taken the same year that the emancipation was filed in Bracken County Court, my 4th great grandparents, Samuel and Mary, in neighboring Pendleton County, have a young man living in their household that is in the column: Free Colored Persons – Males, 10-24 in age. That little hashmark in this column gave me goosebumps. Is this the missing Aaron? I certainly hope so. If this is Aaron, there is a good likelihood that my grandparents were supportive of this emancipation action. If my speculation is correct, and Aaron is the son of Michael or Abel, then Mary had welcomed her newly freed brother or nephew into their home – and I’m guessing to offer protection. But why did no one ever tell us about this relationship? And so the story, while not forgotten or censored out of this branch’s narrative, was whitewashed into the typical benevolent master/faithful servant tripe – transforming Jenny and Aaron to husband and wife, instead of mother and son – and erasing any hint of parental complexity. I think this is another narrative covered in whitewash. There was clearly some family drama going on that the later descendants noted but purposefully made vague to hide what was truly happening. And by 1827, Abel and Michael have been sharing the taxes and/or location of the enslaved family for several years – until Michael suddenly has enough in 1830 and frees the entire lot. Again, the whitewashing was so thick, it’s still preventing us from seeing the full picture of this family crisis. One of the biggest mysteries that came out of the emancipation action was the fate of Jenny and her family. I could not find Jenny nor Aaron paying any taxes on this newly inherited land – nor could I find her in 1840 census records. In 1845, suddenly, the taxes are being paid on 57 acres by “Dean’s Devisees”. According to the 1891 edition of Black’s Law – this term refers to the persons “to whom lands or other real property are devised or given by will.” I could not find record of taxes being paid on this property prior to this date. However, another obstacle arose in discovering the chosen surname of the newly freed family. Did they take the Dean surname? If so, none of them are paying taxes on this piece of property until 1845 – which is a tad odd. I then looked for any woman with the given name of Jenny or Jinny paying taxes on land during these years from 1832 to 1845. Nothing. The estate sale of Michael Dean’s remaining personal property is also a whitewashed hot mess. 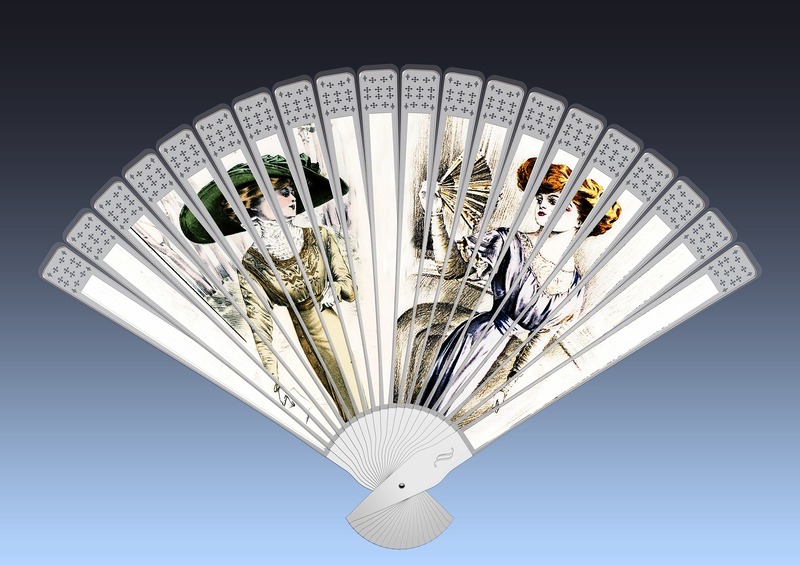 Among the list of personal items being sold that day, Jenny is indeed listed as being the purchaser of several items. Unfortunately, instead of including a surname like everyone else on the list – she was simply listed as “Black Jenny”. Trust me, for a while, I looked for a ‘Jenny Black’ in all of the records I had perused earlier. Nothing. And of course, that’s when it hit me that they were not using the word “black” as a surname. The good news is that after searching court and deed records many years beyond the emancipation, I found a deed transaction detailing Aaron’s act of selling the land. And best of all it gave me a direction for Aaron. First, he had retained the surname “Dean” – and had married a woman named Ellen – and they both lived in Brown County Ohio! This was golden information that even spelled out his connection to the land – the document says that he had inherited this land via the will of Michael Dean. 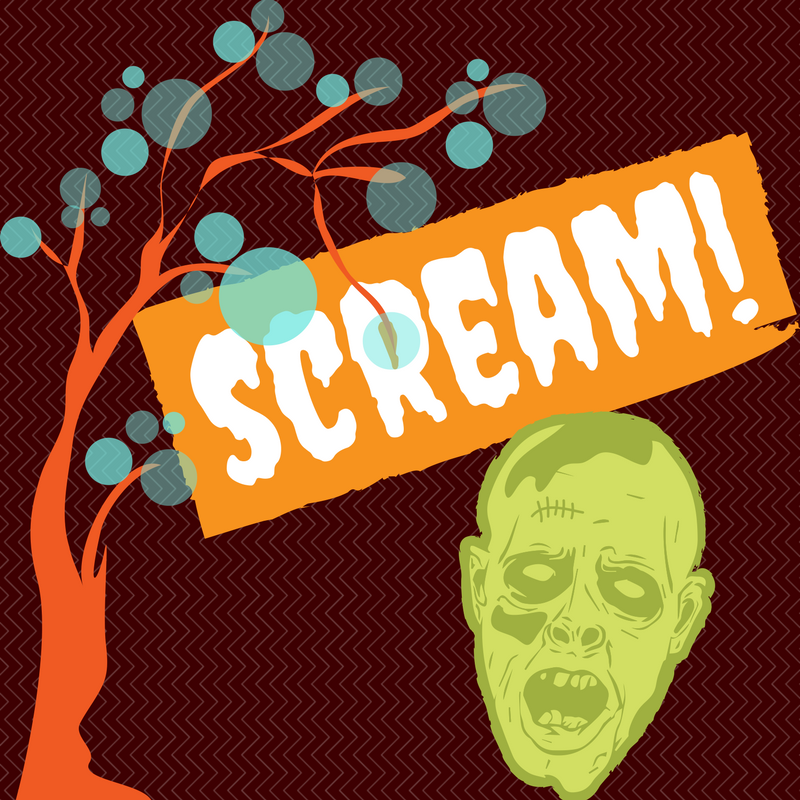 This was a slam dunk – and I had one of those joyous, yet vocal moments in the silent state archives! One thing to note – I am not sure that Aaron and his wife actually came down to Bracken County to sell the land or whether this was handled by an attorney – simply because there is no mention of Aaron’s race. He is not referred to as a ‘free person of color’ nor ‘colored’, etc. Is this proving he never crossed the river to conduct this business, or does this mean he was light enough to be passing? The jury is still out on that one. After this glorious find, the trail suddenly goes cold. I cannot find Aaron Dean in the 1850 Brown County census at all – and I even resorted to paging through each entry to catch a misspelled surname or similar family unit. I have searched other surrounding counties, and found nothing to match. Needless to say, I am still on the hunt for Aaron, and I need to take a trip north to dig into more physical records – but he has gifted me with marvelous clues to take forward! So – despite the forest of unsourced trees on Ancestry – I will occasionally search for a branch in the hopes of stumbling across a tree with valid sources attached to follow in my own research. While searching for more information about Michael, I stumbled upon a tree that included Michael and his (what I believe to be) erroneous Scottish birth. I went down the line back towards Mary, his daughter and my 4th great grandmother, when I hit at something unexpected. Whomever created this tree went to Abel and then to a black family in Ohio with the surname of “Freeman”! One of the ancestors, Joseph Riley Freeman, in his marriage record lists his own surname as “Freeman” and his father’s name as A. Dean and his mother as Eliza Robinson. The creator of the Ancestry tree believed that “A. Dean” was Abel T. Dean of Bracken/Pendleton Counties and attached his family as thus. But what I think just happened – is that the family had an inherited narrative stating that they were descended from Abel Dean, but when a record came along listing A. Dean as the father, they jumped to Abel, missing Aaron entirely. I think the generation just got disconnected and lost. Michael’s son, Abel, was only ever married to Nancy Seay, never an Eliza Robinson. But Eliza sure sounds similar to Ellen, who was listed on the deed transfer of 1852. To make matters more poignant, the family included James Riley Freeman’s nickname “Joe Dean” – and his youngest daughter, as listed on this tree was named “Jennie”. This newly discovered family then includes other surnames in later generations: Ward, Milton, Phoenix, Merritt, Epps, etc. With locations: Greene and Clinton Counties, Ohio + Indianapolis Indiana. As a result – I would LOVE to connect with the person who runs the Peacock Family Tree on Ancestry – I think we have much to chat about! The lesson I learned through all of this, is that so many of our brick walls are held up by centuries of whitewashing. In most cases, on purpose. In a few cases, due to a really twisted and vile version of the telephone game. But do we truly understand the magnitude of expanding our research methodology, and the resulting ripple effect of belonging and healing that can follow? We have got to practice a more robust and inclusive FAN Club approach! Because I’m going to be really frank here – How dare we ever consider our research to be thorough if we profess to practice the FAN approach and ignore a significant portion of our family’s community and familial network simply because of race?! If we alter our research approach to practice a fully inclusive strategy, there is a high likelihood that we will demolish a multitude of mutual brick walls, as well as unite long separated families and begin the process of telling a more accurate history of our communities and our country. I am writing this post with gritted teeth and a fake smile upon my lips – retaining a professional demeanor in the face of such a dangerous fallacy can be almost impossible. 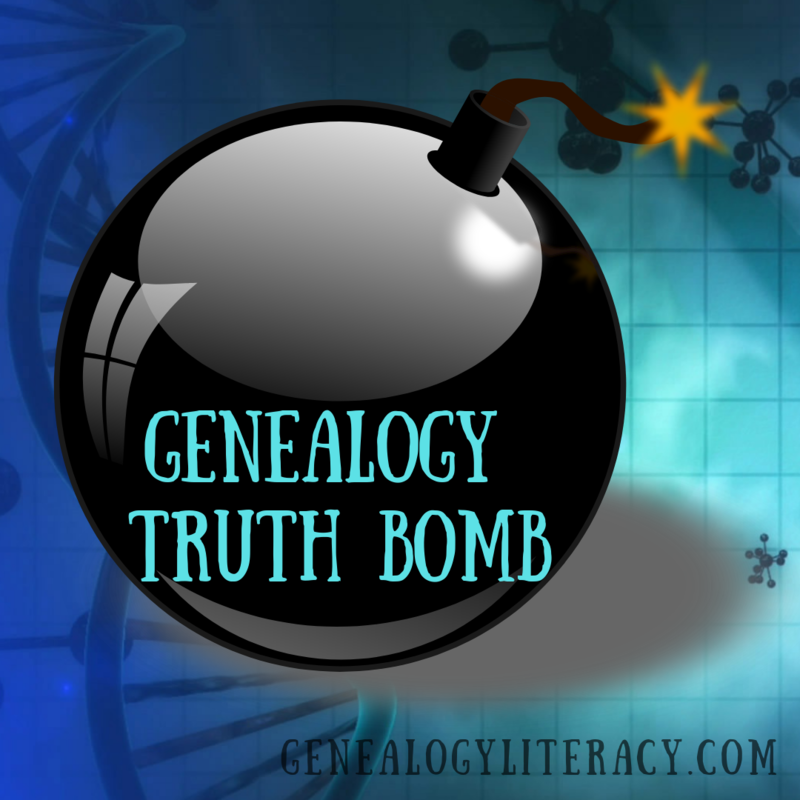 But I promised you undiluted genealogy – and here comes test case number 1! 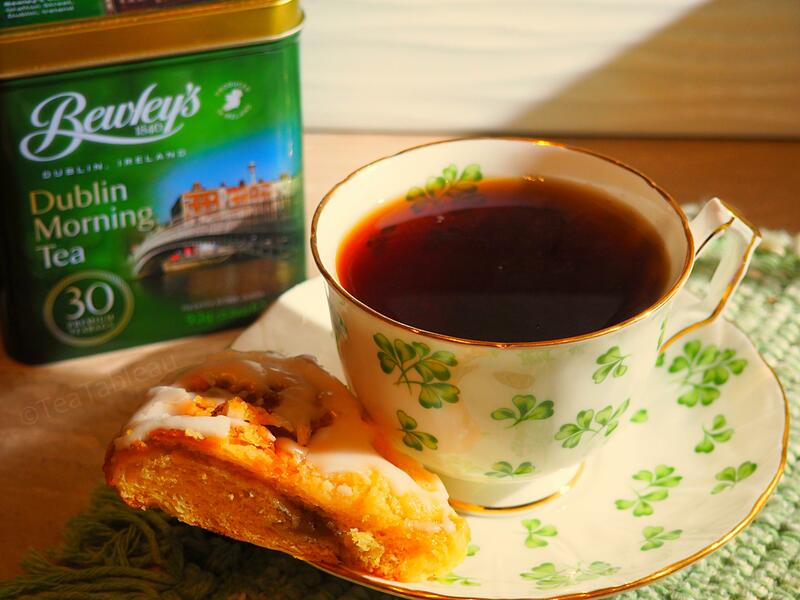 Quick – go get a cup of tea before reading further! She then proceeded to list about 3 wonderful online repositories….which was helpful, in a way….but with no cautionary caveats. Two of the three online resources she shared should have come with cautions: The first one links to an aggregated collection of digitized items from around the state, including maps and newspapers – but what she doesn’t know, is that this site is in limbo, and most early participants no longer share digitization efforts on this site – most have created their own online portals for digitized records. 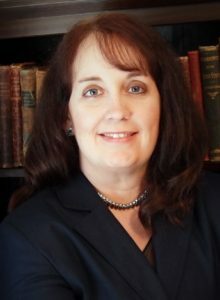 The other site is a go-to for land records, and I recommend this one to researchers all the time – but caution that state budget cuts hit them hard, and digitization efforts had to stop short of the entire collection – some onsite visits would be necessary to access any records past a certain year. Now, I understand that the standard researcher will not have knowledge of these limitations – but the overall impression of digitized record repositories containing complete collections, thereby eliminating a need for onsite research is FALSE!! FICTION!!! JUST PLAIN WRONG!! In fact, DANGEROUSLY WRONG!! Why dangerous? 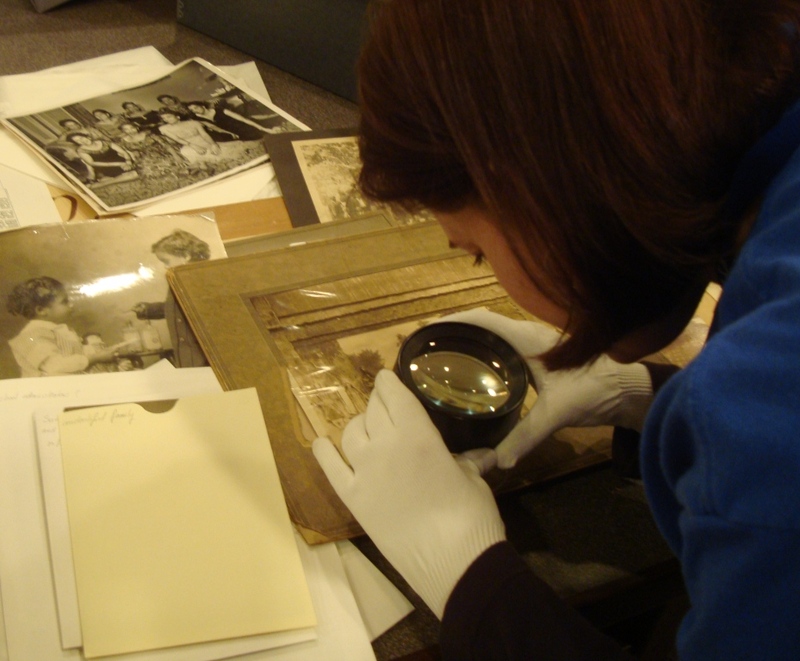 Because the libraries and archives that contain our history operate on funding – local, state, or federal funding. What happens when the visitation numbers go down to a point that makes the keepers of the funds question their allocation that year? They cut, and they cut some more….and they hear local/national statements about everything being online, and they cut further…until access or existence is in extreme danger. How do we stop this madness? 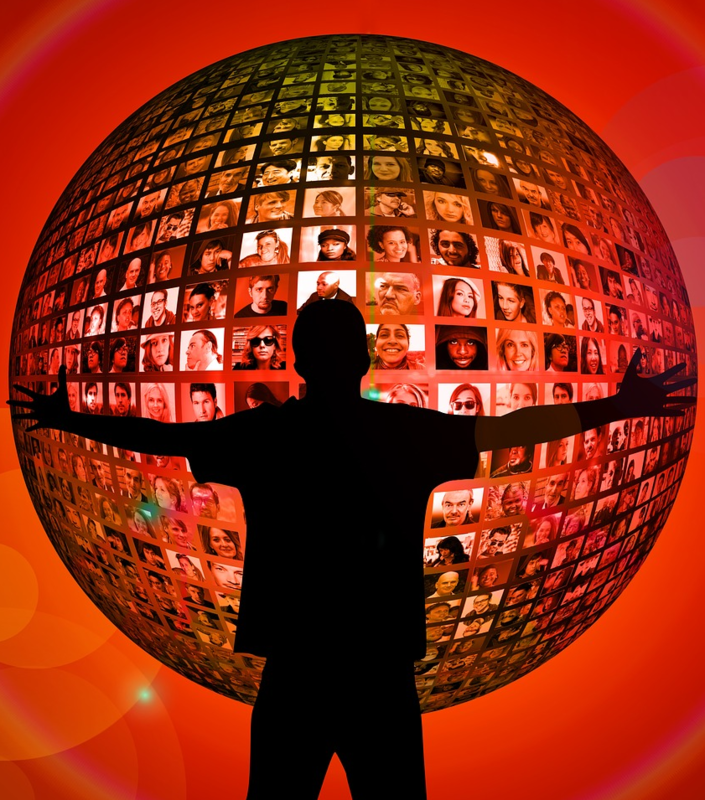 You MUST conduct your research using a tandem approach – and abandon the research vacuum of online only records! 1. PLEASE stop perpetuating the myth of online-only access. Just think about statistical probabilities alone – they are staggering. Since we’ve only been digitizing things for about the past 10-15 years (larger institutions), only a tiny portion has been digitized. And so many smaller institutions are not digitizing at all because of low staffing, technology and budget constraints. 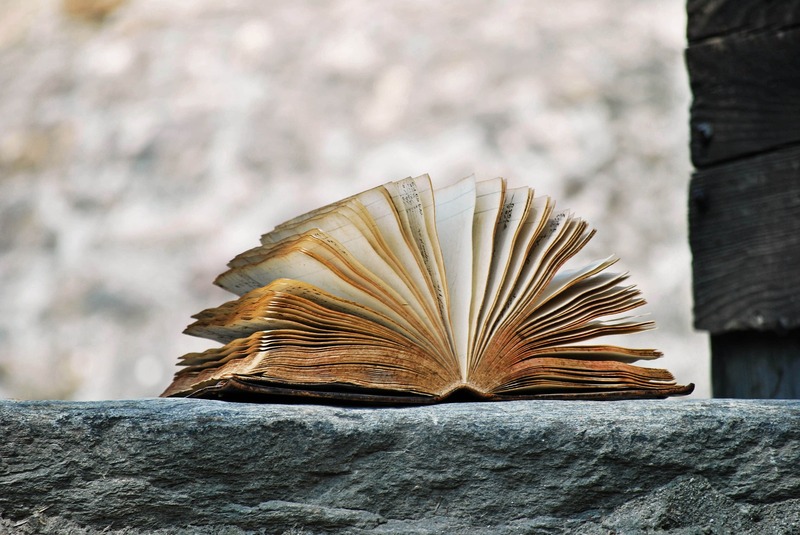 The libraries and archives of the world maintain huge collections of local records and family records – primary sources that can obliterate your brick wall! 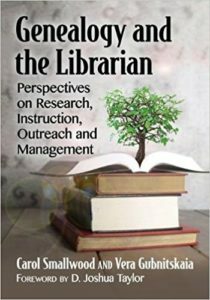 But if we encourage others to research in both places – online AND onsite, budgets grow, and online access continues to grow….otherwise, with the demise of research repositories because of a myth, we run the risk of endangering the existence of our history – and stopping the digitization efforts! 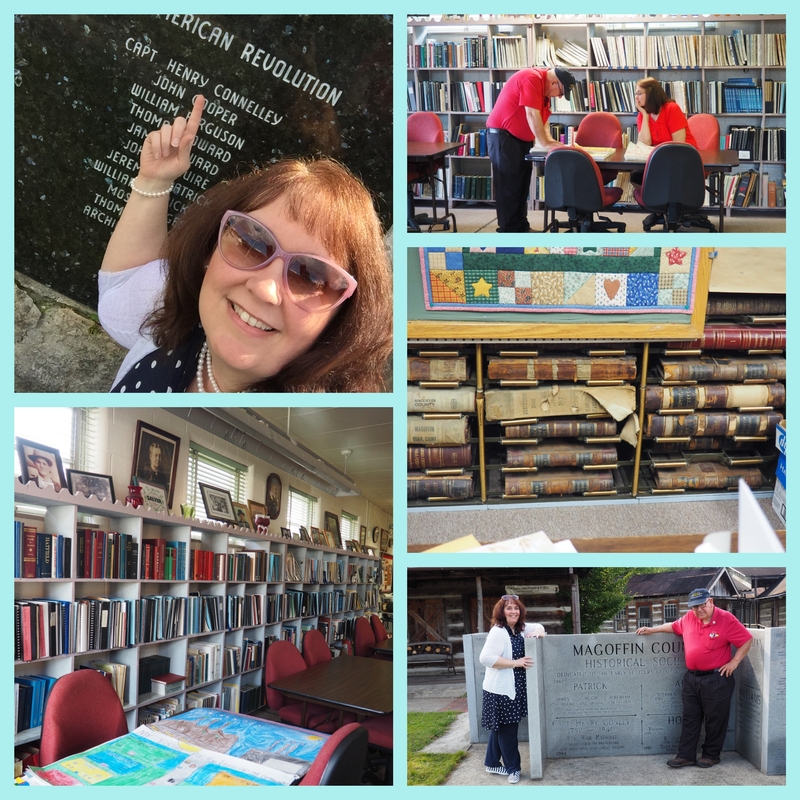 Trust me, the digitization budgets are connected to the libraries and archives – you cannot have one without the other. 2. 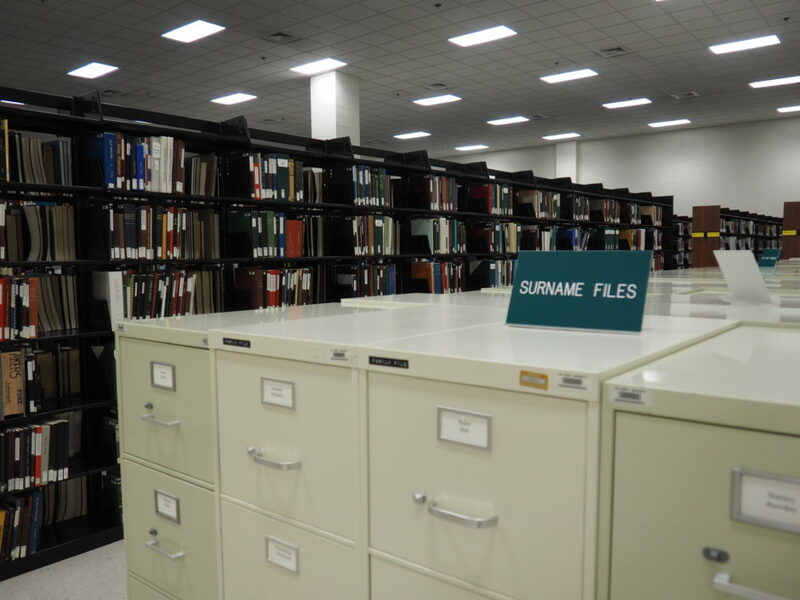 Run tandem research all the time – begin with online sources (images of primary sources hosted on main sites, such as Ancestry and Family Search) – noting the original location of these records. After building your research foundations with the wonderful digitized documents available to us, move to other online resources. Take a virtual tour of the libraries and archives of your state, region, and county of focus. Comb their websites and online catalogs to see what they have – look for several things: catalogs that list many of their items AND separate links that house archival finding aids or any digitization efforts they may be running. Remember: Even catalogs have limitations, and may not contain a list of EVERYTHING in their collection. Also, smaller county historical/genealogical societies may not have a website at all, or if they do, they may only list their location – not a list of what they have. Personal contact would be necessary in this instance. 3. Head out on the road! Now that you have a research plan as to the locations and collections you want to see, you will be much more successful in your results. Be ready to experience some amazing bonuses along the way! 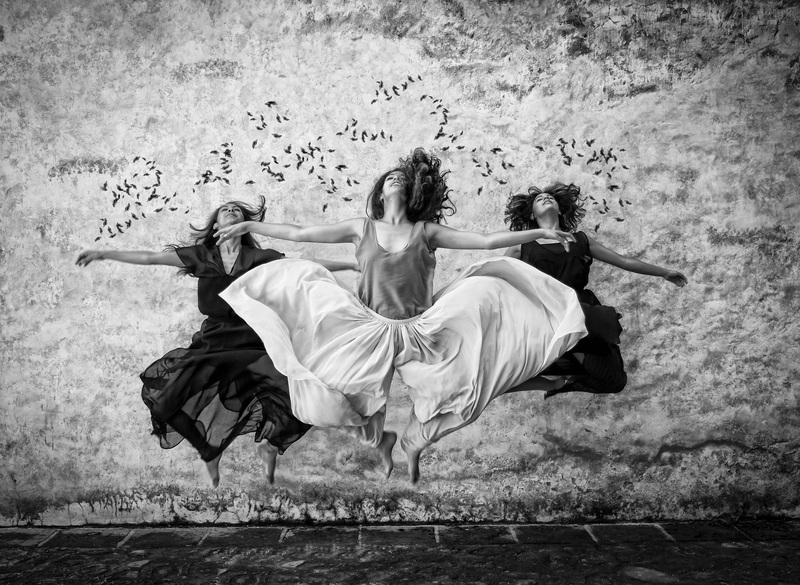 By visiting the area of your ancestral home, you will gain an understanding that is unparalleled. You see the geography, breathe the air, and talk with the people of your homeland. Contextual knowledge of your ancestral community is a vital part to understanding your ancestors. Plus, your visit, though a tad costly, helps maintain the existence of these storehouses of history and information. In short – always think of research as a multi-dimensional process. We are fortunate enough to have wonderful records at the tip of our fingers via super digitization efforts of many – but our research should NEVER stop there! Our storehouses of history contain the family records we need: Bible records, genealogy research files, correspondence, diaries, photos, school and Church records, etc. 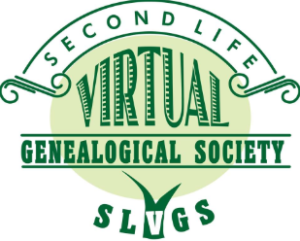 A fundamental principle of the Genealogical Proof Standard is “conducting a reasonably exhaustive search” – NEWSFLASH – online only research is NEVER a reasonably exhaustive search! Great, now I need another cup of tea – and it’s only Monday!